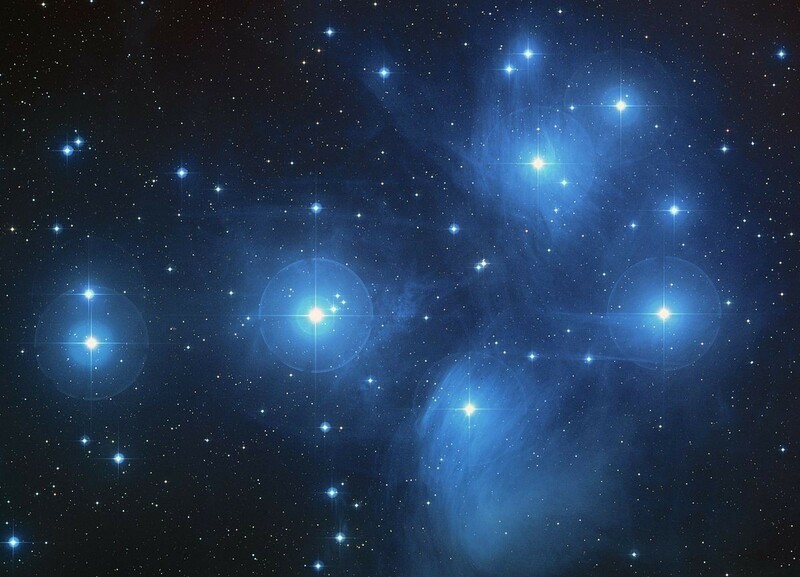 The seven sisters, also known as the Pleiades, is an open cluster of stars, meaning it is a loosely bound star cluster. It is distinctive in the sky because its brightest stars are brilliant blue stars. At least six stars in the cluster are easily seen with the naked eye. With a pair of binoculars or a small telescope, you can see hundreds of stars in the cluster, which makes it an excellent object for amateur viewing. The Pleiades is a fairly young cluster, which actually makes it a challenge to date accurately. One way to determine the ages of star clusters is to look at the color and brightness of its stars with what is known as a Hertzsprung-Russell diagram. But this can overestimate the ages of young bright stars. Another way is to look at the amount of lithium in the spectra of small cool stars in the cluster. Since lithium is consumed in such stars over time, the amount of lithium remaining gives an indication of stellar age. These two methods combined give the age to be about 120 million years. Computer simulations of stellar motion within the cluster indicated that in its youth it was likely a stellar nursery similar to the Orion Nebula. This means the Orion Nebula and the Pleiades can be seen as two snapshots of stellar formation. Since the Pleiades is only loosely gravitationally bound, it will eventually be ripped apart by the differential gravity of the Milky Way. Over the next few hundred million years, the stars of the cluster will smear out, and the stars formed in the cluster will make their own way through the galaxy. The same thing happened to the Sun’s stellar nursery billions of years ago.